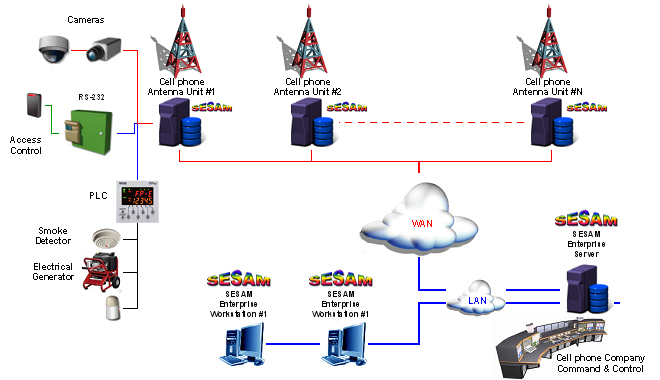 SESAM Cell-phone Company is a Multi site configuration. Cellular antennas are distributed throughout the country. These sites can be secured by SESAM units, which have video cameras, security panels, and access control controllers, and are monitored by a PLC controller connected to them. Thus, full control of the cellular antenna sites is achieved, using WAN or microwave link networking. Multiple sites are connected to a central command and control unit at the cell-phone company’s main site. Full control of the site is available from a remote SESAM unit: Arm / Disarm / Bypass of the security panels, issuing and uploading access-control tags to the controllers, turning on and off different devices, such as electrical generators, lights, etc. SESAM Workstations allow additional operators to view and monitor the system, with full access to the system as in the Server. Authorization can be limited to the different users, depending on their security level.